Is Burlington County Prison haunted? 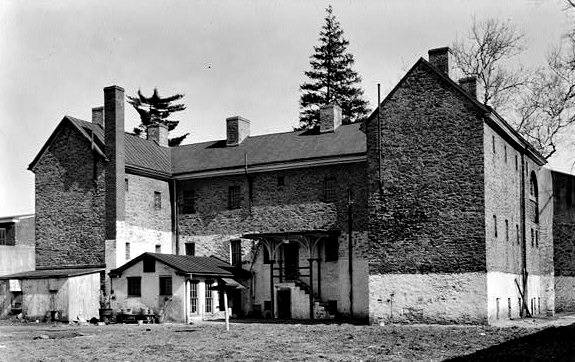 Construction on Burlington county prison was completed in 1811 and originally intended to house 40 inmates. Comprised of brick and stone with poured concrete walls and ceilings, the prison was much more secure and didn't have the fire risk which came from earlier prisons which were constructed with a lot of timber. The prison operated very successfully due to its design and was in use from the day it opened in 1811 right up to 1965, a staggering 154 years, making it the oldest operating prison in United States history when it finally closed down. Another more modern and larger facility was built near by to house the areas criminals and the old prison was closed down until it was reopened as a museum. The building is currently supported by the American Prison museum association and holds some interesting stories and certainly worth a look around if your in the area. Now as you can imagine, a prison is one of those buildings which if anywhere is going to be haunted, its going to be somewhere that has experienced much suffering and misery. This prison is definitely not an exception to that and has come to be known as one of the most haunted places in New Jersey. Most haunted prisons seem to have the same type of hauntings, such as banging noises on bars and footsteps in empty corridors or apparitions, and though this building has had all three of those reported before, its nice to find a prison which has something a little different. Within the shower area of the prison, an apparition of a naked man has been seen standing in the shower area, but the unusual thing about this particular ghost is he is known to leave actual footprints in the dust around the shower area. Hes not the only unusual spirit in the building either, since the basement has its own manifestation. This area is one of the most active in the whole building and is normally filled with orbs, some of which people have claimed to see with their bare eyes as small faint balls of light. The manifestation also likes to represent itself as a tall, thin man who just stands and stares at people, often appearing very close to them. The third floor is very active for various unexplained phenomenon, with everything from voices in the cells to full on apparitions to objects being moved. The last area of the prison that's noted for its activity is the display gallows which have seen a number of appearances from past murderers who were executed there, with even the sighting of a man with no legs who has been seen more than once. The prison is open as a tourist attraction and sometimes holds tours so if you are ever in the area i suggest having a look at this historical building and maybe you will find out if its haunted or not for yourself.